Successful investing requires patience, discipline and a structured approach. At Lake Hills Wealth Management, we use a rule-based investment strategy that is centered on macroeconomic and technical factors coupled with low-cost investments, tax efficiency and your specific needs. Many individual investors allow emotions and news headlines to guide their investment decisions which often leads to buying high and selling low. Our strategy removes emotion and non-factual information from the decision-making process. The clarity that results is powerful, enabling strategic decisions that will ultimately create the outcome required to achieve your investment objectives. "Macro-trading requires a high degree of skill, focus and repetition. Life events, such as birth, divorce, death of a loved one and other emotional highs and lows are obstacles to success in this specific field of finance." • Establish portfolio objectives and risk parameters according to your financial goals. • Conduct cash flow analysis to understand your income needs now and in the future. 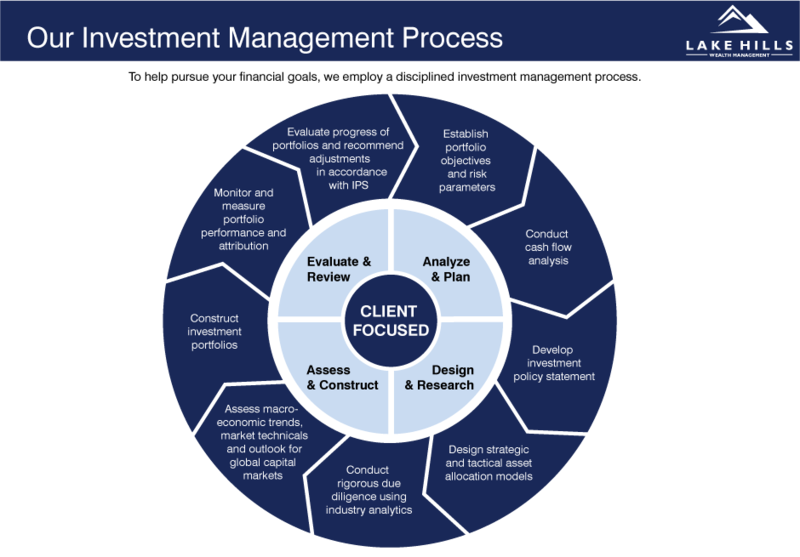 An investment policy statement is considered to be the most essential step in the portfolio management process. Your IPS will contain your goals and constraints as they relate to your investments. As we develop an IPS with you, it will not only require you to carefully consider your short-term and long-term true financial needs, but it will also provide important guidance to us in meeting those needs. Your IPS will serve as a guidepost for us both now and in the future. When there is market uncertainty or when your needs change, referring back to your IPS will ensure that any adjustments we make to your portfolio will always line up with your goals and values. • Design strategic and tactical asset allocation models - Our models are built around Modern Portfolio Theory, macroeconomic trends and other technical data that we consistently monitor to ensure your portfolio is in-line with the current stage of the economic cycle. • Conduct rigorous due diligence using industry analytics – Our priorities include understanding the underlying investments exposure, investment structure, tax liability, liquidity, total cost of ownership and other general investment details. • Assess macroeconomic trends, market technicals and our outlook for global capital markets – These factors drive the assets class selection process. • Construct investment portfolio primarily using low cost investments such as ETFs, ETNs, Index Funds and Stocks. • Monitor and measure portfolio performance and attribution. Our team reviews your portfolio on a regular basis to ensure your investments are performing in-line with a risk-appropriate benchmark. • Evaluate progress of portfolios and recommend adjustments in accordance with the investment policy statement. We constantly monitor macroeconomic trends and market technicals to ensure your portfolio is appropriately invested. During our review meetings we will perform a market update, discuss the changes to your portfolio and make any needed updates to your investment policy statement (IPS).